Please welcome Gerald Brandt to the blog! His new book, The Courier, just came out and Gerald answered a few of my questions about it, and more! Will you tell us about The Courier and what inspired you to write it? First, thank-you for having me on My Bookish Ways. 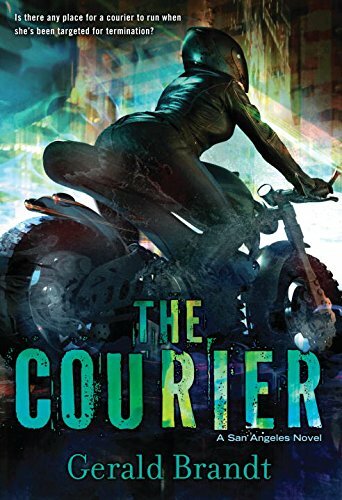 THE COURIER is an interesting mixture of near future science fiction and fast-paced thriller. Kris Ballard is a motorcycle courier. At sixteen years old, she’s been through a lot. Her parents are dead, her foster aunt and uncle were abusive, and she’s a runaway. To make matters worse, she witnesses the gruesome murder of one of her clients, and now she’s on the run, pulled into a world of corporate espionage and deceit. Kris is doing anything she can just to stay alive. The story started with Kris as an (almost) fully developed character. She sat in my brain for quite a while before I figured out what world I wanted to put her in to. Once I had both, this book almost wrote itself. What makes Kris Ballard (great name by the way 😉 such a compelling character? Why do you think readers will root for her? Kris is strong and independent, and she has worked hard to make herself that way. Despite all the set-backs thrown at her, she’s worked her way into a position where she pays her own rent and puts food on her table. That’s not to say life isn’t rough. Sometimes she needs to make decisions between paying rent and having a meal, and her motorcycle needs some work that she’s been pushing further and further out, but she’s not relying on anyone else to make those decisions for her. Having been through hell to get to where she is, Kris is still a softy. If getting ahead in life means stepping on someone else, she won’t do it. When everything falls apart, Kris is able to use the tools she’s built over the years to try and stay ahead of the corporations hunting her. Every decision she makes could be the difference between living and dying. What kind of research did you do for the book? Will you tell us more about your setting? Surprisingly, not much. Although THE COURIER takes place on Earth in the near-future (2140 to be precise), the city is a new construct and made of ‘whole cloth’. San Angeles is a corporate owned city that stretches from the Mexican border to San Francisco. In order to handle the growing population, the city built up. It currently sits at seven levels, stretching over 200 meters above ground in downtown Los Angeles. Only Level 7 has access to open sky. Every other level is surrounded by the wall, keeping the population enclosed. When I built San Angeles, I wanted the city levels to reflect societal boundaries. People living on Level 7 are the elite, just below the 1%, if you will. Those living on Level 1, which is ground level, are despised and trod upon. When Levels 6 and 7 were built, access to them was limited and controlled, stopping those that did not belong from entering, and creating an even bigger gap between the population. The 1% tend to live on massive satellites in geosynchronous orbit. There are a few times Kris needs to go to Level 1, and for that, I needed to look at current Los Angeles to make sure the places she went were real and plausible. Hopefully people will recognize a few of the landmarks I brought in. One final piece that required research was for one of my secondary characters. He has Apserger’s, and although it’s never stated in the book, I wanted to make sure I got the small details right when he interacted with people and things. I hope I did it justice. What supporting characters did you particularly enjoy writing about? I had the most fun with three of my characters. Quincy is not a nice man, and being able to write evil with such abandon was surprisingly freeing. Just going through different scenarios with him, and deciding on the most evil thing he could do, both in the short and long term, was exciting. I even managed to surprise myself. The second one was Devon. Devon has Asperger’s, and pretty much the perfect job as far as he’s concerned. As I mentioned above, getting the details right on his personality was challenging. The last character has only a bit role, really. He comes on-stage for only a single scene as almost a grandfather figure for Kris. I remember writing back when I was in Junior High. I’d grab my notebook and find a quiet corner in the library and plot and map and write. I still have one of those notebooks in my office. I keep it well hidden, so no one can see how bad I was. Sometime in grade 11, computers were introduced to my school, and I lost myself in them. I thought I stopped writing simply because I didn’t have the time. Recently, however, I’ve discovered that coding draws from the same well as my writing. If I’m programming a computer, my writing suffers, and vice versa. I end up doing neither job extraordinarily well. Now, I do mostly IT work, and the writing is working out. I decided to get back into writing at a later age. I’d had a good career in computers, and the old urges to write were rearing their heads. Ten years after I’d made the decision to write again, and to really work at it, I sold my first novel to DAW. How do you balance your day job with your writing, and of course, spending time with your family? It is extremely difficult. I’ll start with the home and family side first. Book 2 in the series had a fairly tight schedule, and in order to do it, I needed help from both my employer and my family. My regular schedule (though the mornings are tough) is wake up at 5:00 AM, write until 7:00 AM when the kids get up. Get them off to school and get to work by 8:45 AM. When I get home, I have dinner with the family, then back to my office until 10:00 PM. On good days, I’ll let myself out at 9:00 PM or so, and watch TV with my wife. On weekends, I write as long and as much as I can. That schedule leaves me no time for a lot of things. My wife and kids have been extremely supportive, taking over all of the household duties that I would normally do. I am blessed. Luckily, book three (THE REBEL) has a better schedule, and although I still don’t do my fair share around the house, I am trying. Work has also been flexible for me. I attend conferences and conventions, and they have always let me have the time off. I either make up the time lost, or mark them as a leave of absence. During the last push for THE OPERATIVE, I took two weeks off with no issues. I’ve almost worked them back! Why cyberpunk? What do you enjoy most about reading, and writing SFF? I actually didn’t set out to write a cyberpunk novel, and it isn’t really cyberpunk in the old sense of the word, like NUEROMANCER or SNOW CRASH. There’s no jacking in to computers and virtual reality. What there is, is fast computers, massive corporations and surveillance, and weak governments. The end result, I think, is a more modern take on cyberpunk. What I enjoy most about reading SFF is a tougher question. I’m a more critical reader now than I was when I started writing, so books that I enjoyed years ago may not grab me as much as they used to. That being said, I really enjoy strong characters and well thought out settings. There has to be a good plot, but it comes after the characters themselves. What I enjoy about writing SFF is the sense of exploration, extrapolation, and wonder. If I’m doing science fiction, I can have flying cars that run off of peoples thoughts. As long as I can draw a line between todays technologies and where I want to be, and make that line believable to the reader. Writing fantasy is similar, though I don’t have to tie it back to the real world, necessarily. Making something outlandish and magical, as well as believable, is just fun to do. What do you like to see in a good story? Is there anything that will make you put a book down, unfinished? As I mentioned in the previous question, good strong characters is a definite plus for me. By strong, I mean characters that act in a believable manner based on the information that author has given me, characters that lead the story, and are not led by it. If the character does something totally against what I understand of them, I’m done. If the writing and the story are very good, I’ll stick with the book, but if it happens again, the book is gone. This is a tough one for me. I read widely, and enjoy a lot. Still, if pressured, I’d have to go to my bookshelf and look at the names that come up the most. I see a fair amount of Dave Duncan, almost every David Gemmel, a huge chunk of Asimov, Neal Stephenson, and William Gibson. I also see some Jeffrey Deaver and Lee Child. Currently, nothing. I’m plotting THE REBEL, and I never read a book when I plot. Previous to that, I re-read NEUROMANCER and finished Robin Hobb’s ASSASSIN’S APPRENTICE series. I just handed in THE OPERATIVE to my editor, Sheila Gilbert at DAW. No news on whether or not she likes it yet, but these things always take time — I have one editor and she has multiple authors. My agent, Sara Megibow at kt literary loved it, so I’m feeling pretty good. We writer’s tend to worry anyway. I’m starting THE REBEL, book 3 in the San Angeles series, and am fiddling with an alternate world fantasy novel. One thing at a time though. Gerald Brandt, interview, The Courier.